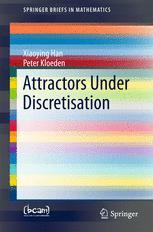 You can download Attractors under Discretisation by Peter Kloeden and Xiaoying Han free in pdf format. This work focuses on the preservation of attractors and saddle points of ordinary differential equations under discretisation. In the 1980s, key results for autonomous ordinary differential equations were obtained – by Beyn for saddle points and by Kloeden & Lorenz for attractors. One-step numerical schemes with a constant step size were considered, so the resulting discrete time dynamical system was also autonomous. One of the aims of this book is to present new findings on the discretisation of dissipative nonautonomous dynamical systems that have been obtained in recent years, and in particular to examine the properties of nonautonomous omega limit sets and their approximations by numerical schemes – results that are also of importance for autonomous systems approximated by a numerical scheme with variable time steps, thus by a discrete time nonautonomous dynamical system.